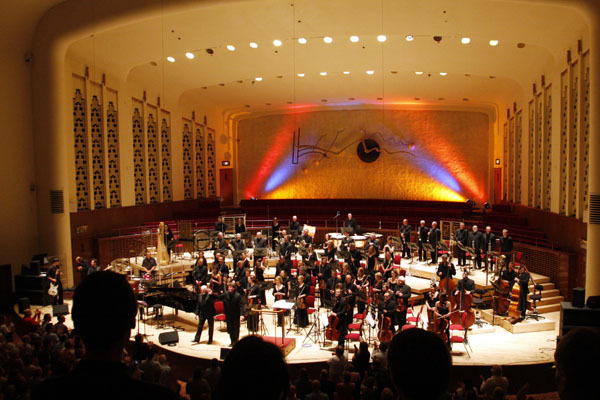 A fresh, new arrangement of The Telemann Experiment opened Jon Lord’s concert at Liverpool’s Philharmonic Hall on Wednesday. Two-and-a-half hours later, the concert ended with standing ovations. Sans rhythm instruments (not counting Jon Lord’s tapping foot), the new version of Telemann is softer and with more emphasis on the sweeping string themes. As such it proved a gentle way to open the concert on a warm summer evening. – It’s about sitting in a window with a glass of wine on an evening like this. The soft and tender Evening Song hasn’t lost any of its glory in becoming an instrumental. It still inspires images of a lazy summer breeze making slow waves in cornfields. Time for the first of the evening’s main attractions, Jon Lord’s newest creation, To Nothing Such Things. Introduced as a way of putting on paper how Jon felt about his dear late friend Sir John Mortimer, the piece proved its qualities as a both touching and imaginative tribute to Sir Mortimer. Featuring Cormac Henry on flute and the Royal Liverpool Philharmonics, the sound and feel of the piece came extremely close to gorgeous smoothness of the version on the new album. Henry occupies stage centre throughout with his wonderfully swooping, thrilling and breathtaking flute performance. The music is often both delicate and intricate. One second you are listening out for the proverbial pin dropping in the (almost) silent music, the next you’re overwhelmed by its dramatic bombast. Towards the final movement, To Notice Such Things portrays Sir Mortimer’s final months and thus turns to a sadder tone. You visualise snow falling gently on a dark winter day of mourning after Mortimer’s passing. All in all, To Notice Such Things in concert was a stunning work of beauty. After the interval it was time for the (other) big one of the night – Concerto for Group and Orchestra. – We’re going back 40 years now. 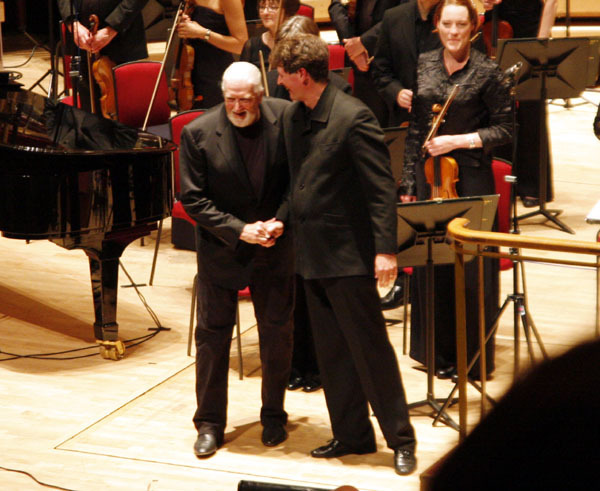 This is a loveletter from a rock musician to an orchestra, explained Jon Lord. The first movement was taken at a slightly faster pace than heard before with conductor Clark Rundell urging the attentive orchestra along. As opposed to the first half of the evening, which had featured a scaled back orchestra without percussion and most of its horns, for the Concerto, everybody came on board including the band players, which in turn necessitated amplification of the orchestra. But only ever so slightly, and to excellent effect. During the louder sections, the sound of the orchestra literally engulfed you. The guitar solo, handled by Mark Zyk from German DP tribute band Demon’s Eyes, induced goosebumps as he tore through a selection of vintage Ritchie Blackmore-isms anno 1969-74. The second movement offered even more spine tingling moments, particularly that one spot between the vocal sections where the strings suddenly swell up and wash over you. Singer Miller Anderson was standing in for Steve Balsamo, who’d had to cancel because of illness. But he was no second rate replacement. – I’ve only ever sung the Concerto parts once before, he said during rehearsals, and then put on a very convincing performance during the concert. The third movement spelt power. Throughout the Concerto, the Hammond organ had featured prominently loud and clear in the sound. Same thing in the third movement where Lord every now and then would let rip, clearly feeding off the energy coming from the orchestra. Steve White on drums managed to captivate the entire percussion section of the orchestra with a solo brimming with powerful rolls around his kit. Again, the third movement moved from finesse-filled whispers to exploding thunderstorms. The Concerto concluded with resounding oompf and the hall filled with yells of Bravo!, as the audience got on their feet for the evening’s first standing ovation. – What an orchestra!, exclaimed Jon Lord. – You can be very proud of them. One of the best I’ve ever worked with, he told the audience. The encore was Pictured Within, and with original singer Miller Anderson it became a moving rediscovery of his inimitable delivery of the words – slightly bluesy and with a very relaxed feel. A beautiful way to end an evening of orchestral excellence with Jon Lord. 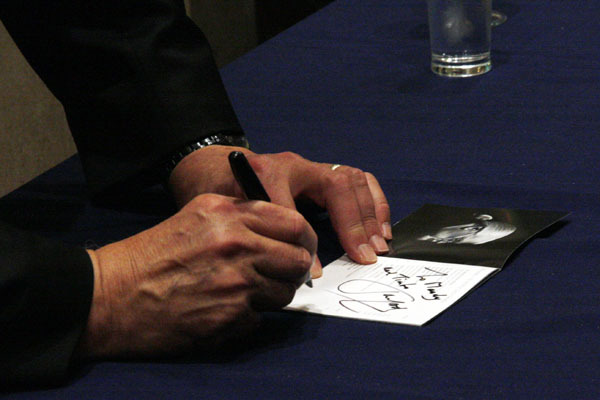 After more standing ovations and a handful of recalls, Jon Lord met his audience in the merchandise stand where he spent more than an hour signing autographs on old and new records and chatting to the fans who’d formed a queue that stretched all the way around the room. 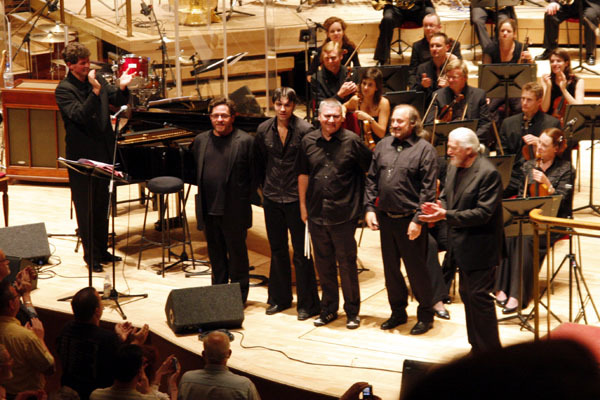 Jon Lord’s first solo concert in the UK with a full symphony orchestra had been a success. A tremendous night. To Notice Such Things was extremely beautiful, the acoustics of the Philharmonic Hall warming the sound perfectly and Cormac’s performance was stunning, as was Thelma’s superb playing in the many exposed solo violin passages. The concerto was barnstorming – perhaps the band overpowered the orchestra a bit too much at times but the overall effect was electrifying. The last movement was particularly exhilarating and the encore was terrific – Miller’s vocal complemented the delicacy of the piano and orchestral playing to great effect. Thanks Jon and the RLPO for a great night and on a personal note, it was an honour to meet you sir! After what was one of the most musical, thoughtful,entertaining concerts I have ever attended, I spent this morning reading through the programme notes and listening to the “To notice such things” CD which Jon was kind enough to autograph for me. All I could manage last night was to say “Thank you” at least four or five times and now I must say it again. Now that I have been able to read the thoughts behind all the items, I am even more taken with the everything on the CD. As one who has spent many years playing a variety of music – jazz in particular – I think it grossly unfair that one man should not only have the enormous talent to write and to perform to such a high standard but should also have such a marvellous way with words! May you, Jon, always have success and happiness in life. P.S. I think I should start listening to some “Deep Purple” now as well!!!!! A superb evening in a wonderful venue – a night that I will remeber for years to come. A balanced programme of music with top class performance from Jon and the rockers in harmonic symbiosis with The Phil’; such a great example of mutual compliment. 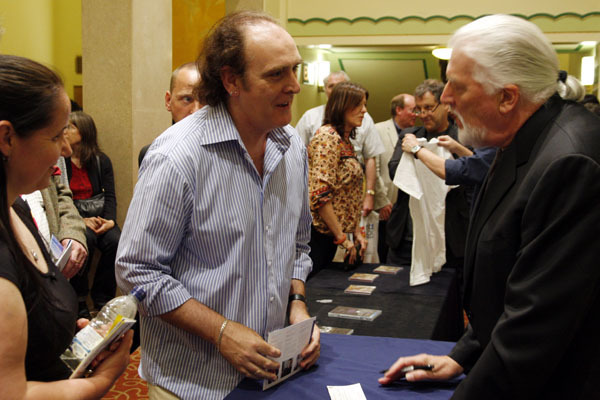 Jon was the true gentleman as ever and spent a long, long time chatting with fans and signing their CDs and other merchandise that they had brought with them. I know he was one of the last out as I got the chance to chat with him again outside. I think the Phil’ must have given him the cat to put out and the keys to lock up. It was a once in a lifetime experience but one which I hope will be repeated. Till the next time Jon !